Truth time here on The Book Club Blog. I found this book at the library and picked it up because I needed some light- hearted entertainment, and where better, than chick lit? I haven’t read any of her books before, but decided to give her a go. For some reason, I just haven’t ever ‘felt’ it when picking up her books. And I’m sure you know what I mean by it. That feeling of knowing you’re going to enjoy a particular book, or not even enjoy it, but its going to nab your attention. That magical feeling when you know you have found something that appeals to that secret reading part of you. But, I ignored the fact I hadn’t felt anything and checked it out of the library anyway, I was desperate for a ‘non thinking’ book! Well, a non thinking book it is indeed. I read it in one sitting. Or should I be more clear in that when I say read, I mean skim read. This book is written in the format of emails and text messages, which I don’t mind at all, in fact a story can be told extremely well in this way, remember this review? But I found this one to be very long winded. I don’t suppose it helps that the story line was fairly long winded too. Rosie and Alex are childhood friends, thick as two thieves and do everything together. They grow up from naughty children to rebellious teenagers until Alex’s family moves from Dublin to America. Rosie stays behind and on the eve of her departure from Dublin to meet up with Alex and go to college, she falls pregnant. Here starts the story of how Rosie and Alex keep missing each other due to marriages and missed flights and divorces and more marriages. It is a typical case of ‘fate meddling’, ‘not taking the bull by the horns’ and ‘keeping ones feelings to oneself’. Then at the end, they manage to get together. And the story starts again with Rosie’s daughter having a similar but not so drawn out experience with her childhood friend. I cant say this book blew the wind up my skirt, but for an evening of not thinking, it worked very well. 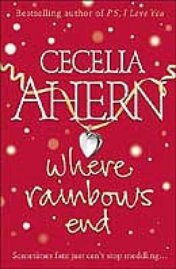 If you like this type of story, you will most likely enjoy this book, if you are a fan of Cecilia Ahern, you will probably love it. But, considering I have never read any of her books before, I couldn’t honestly say. I haven’t read any of her’s, oh sorry I read PS I love you, which was quite good. But apparently that is her best one. Not sure i’d want to read a book that was classified as ‘non-thinking’.